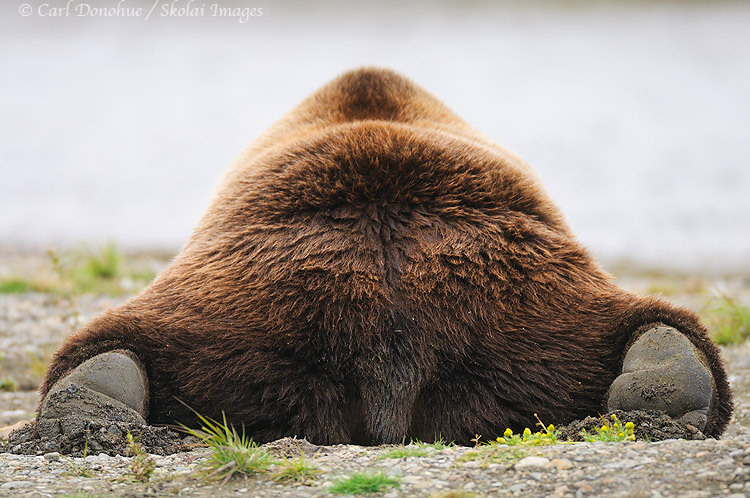 A grizzly bear, rear view, Katmai National Park and Preserve, Alaska. Please click on the image above to view a larger version of the photo. As often as I’ve run across discussions about art and photography, I’ve never really heard anyone ask this question. Most artists, painters, writers, musicians, sculptors, dancers, etc, practice, routinely. But how much practice do you, as a photographer, actually do? I don’t mean “time in the field shooting”. I mean time in the wood shed, practicing, honing your chops? I mean sitting working on a particular technique, idea, composition, theoretical study, etc. I have, and virtually every musician I know has, spent countless hours sitting with my guitar on my lap playing the same thing over and over and over; I don’t think photography has any equivalent approach. I’ve definitely read photography books, and taken classes, and worked on an idea, or composition, but I don’t think anything comes close to a real substitute for practice. Repeating a particular pattern or motif endlessly trying to make it feel second nature. I’ve also spent time with my gear, making sure I know how to use it (well, to some degree; I’m pretty bad about doing this). But that’s not really practice either. Practice is repetition. I’m not sure photographer’s really try to repeat something; we try to do it differently, not duplicate it (unless we’re at shooting an icon, of course). I’d differentiate this from polishing compositions. As a musician, I do that every time I write. Photographers do this, a lot. But I think that’s markedly different to ‘practice’. Don’t you? This entry was posted in Alaska, Art, Katmai National Park, Photo Tours and tagged Art, music, Photography on December 2, 2010 by Carl D.
Interesting post, Carl! Perhaps the sticking point here is your formulation “Practice is repetition.” Like you say, it’s hard to see how repetition really applies to photography; if a shot is repeatable at all, there’s really no skill involved in repeating it ad infinitum. But aren’t musicians and dancers really the only artists for whom lots of rote repetition applies? No writer practices by writing the same sentence over and over. Painters and such might copy other works some, but a lot of their practice involves work that isn’t strictly repetitive. For me, when I go out shooting, I usually start making images that I know very well won’t be keepers early in the outing. I think of it more as warming up, but I’d say it would be reasonable to call it practice, working with the compositional part of my brain and interacting with the location so that when conditions get good I’m ready for the serious shooting. Taking pictures of family, friends, birthday parties, pets, etc. also fulfills some of this role for me. And I would agree that shooting icons might qualify as a sort of practice, though I doubt most icon shooters think of it that way. I suppose in the end I’d say that practice for any art means simply doing it a lot. Giving oneself limitations, like working under unusual conditions, with unusual subjects, or with specific gear, can direct that practice some, but in the long run you’ve just gotta keep at doing something. Most of what I once considered my best work has come to look like practice for the keepers I’m getting now. I hope that trend continues! Interesting point, Carl! Perhaps this is one of the reasons that it’s relatively easy for people to get into photography, and get good at it quickly. You don’t go from never having played guitar to producing interesting compositions, or even playing complicated covers, in a few years of practice. But I’ve seen several photographers do just that with nature photography! When I used to play guitar myself I actually hated ‘practicing’. I spent pretty much all my time playing around on different scales, just soloing by myself. In a sense, that’s how I do my photography too. As Jackson noted, the closest thing I can think of as practice would be purposefully duplicating someone else’s compositions — like learning and playing covers, you learn a lot through this process, and generally end up with something aesthetically pleasing, but it sure won’t be original and exciting art. If you’ve ever tried to EXACTLY duplicate an image, you know how incredibly difficult it is.. you really start to pay attention to all the details that you might have otherwise overlooked. I have to agree with Floris and Jackson. I believe that “practice” for our art is not in perfected repetition, but in multiple trips to the field, flawed execution and momentary (or Floris’s case, long stints of) brilliance:D. I learn from my mistakes in the field trying new things and sometimes re-executing old flaws and re-imagining ways to execute techniques better. I think practice doesn’t make perfect, but flaws can get you closer. Chase Jarvis recently had a post on his blog “Whatever makes you nervous”. He quoted Mario Andretti, “If everything seems under control, you’re not going fast enough.” You have to push yourself. Get out of your comfort zone, reach beyond the comfortable. That doesn’t come from plucking the same strings the same way each time. Thanks for your comment. The difference though is that practice is about a woodshed. It’s about playing stuff that you know isn’t an “end product”. We practice stuff over and over though we know this isn’t the performance or the product. In photography, an example might be practicing manual focus. Or even practicing autofocus tracking on a moving subject, like birds in flight. I can remember sitting by a high way with my old manual focus 400mm lens trying to keep focus on the nearside wheel of oncoming cars (try doing THAT today and see how long it is before Po-Po arrive). 🙂 I’d do it many times with no film in the camera at all. Super boring, but I got reasonably decent at tracking moving subjects with manual focus. Painters practice for years. A lot of it starts younger, and they learn (and practice) basic drawing skills, like drawing/painting a circle. Writers? I can’t tell you how many lines I had to write as a kid. We all sat and repeated the basic technical process of how to write, no? Writers DO sit down and write certain passages repeatedly. Certainly sculptors and potters practice. I think you’re looking at this from the perspective of advanced writers, etc. Most musicians I know, including myself, no longer practice scales daily; simply because we don’t need to. I can usually play a passage a couple of times and get it down pretty comfortably. As much of my time ‘practicing’ nowadays is ‘playing’ is ‘composing’. My photography is much the same. But how many photographers ever really did ANY practice? In some ways, I agree that practice means ‘doing it a lot’ .. but I think you have to add ‘giving it your attention’. It’s easy to sit and play guitar, for example, and not really be giving it one’s attention. Same thing with many aspects of photography. I differentiate between ‘playing’ and ‘practicing’. The 2 are not the same thing, and they don’t yield the same results. As a teacher, I stress that to my students; both are requisite, I think, to become a good musician. Music is, essentially, play, so we should do that, definitely. But I think ‘practice’ is necessary as well. With the exceptions of folks like Jimi Hendrix (statistically, he doesn’t exist), musicians practice their scales, cords, inversions, passages, etc, etc. Dave – Again, I think you’re speaking of photography at a level where “practice” in most art genres probably becomes more of “play”; going into the field and shooting, shooting, shooting, etc, etc. I LOVE to sit and play my guitar to that point where things are out of control; that edge is a great place. It may be THE reason why we engage art at all. But I don’t think many people can get near this place without practice. Here’s a scenario. Musicians often get together and jam. Make sh** up and play together. And doing so with every ounce of passion they have. Isn’t that the same thing as “multiple trips to the field, execution and so forth”? In light of all this, I’d rephrase Floris’ point; “practice could be purposefully duplicating someone else’s compositions” and change it to include any compositions, including your own. Just got done PRACTICING my mandolin for about two hours. I’m a newbie at the instrument, but am completely motivated and inspired to become at least a competent player over the next year or so. Anyway…..Thanks for your great posts! I love checking out your photography and reading your comments about phototgraphy, art, music, the environment, and life in general. Recently, you had a post about waiting to take a picture in the Grand Teton National Park, listening to “Tone Poems” by David Grisman and Tony Rice. Thanks for the tip! I was recently at a music store in Lansing, MI, buying a case for my mandolin, when I saw the disc and purchased it. Way cool! I can only aspire to some day play the mandolin 1/10th as good as the Dawg! I have seen both guys live, and they truly are amazing. As for the photography….I am, at best, an amateur, but I do think I have taken some pretty damned good photos of some pretty cool places in my time. Screw the icons – I like taking pictures of places I had to work to get to. Some of my faves include a sunset over the Pacific Ocean from a beach in Olympic National Park in Washington, a gnarled old bristlecone pine in Great Basin National Park in Nevada, Grewingk Lake and glacier in Kachamek Bay State Park in Alaska, and a waterfall on a canyon trail near Tucson, Arizona. I’m not even close to being even a competent photographer, but I do think that any photograph is enhanced, at least in the eyes of the photgrapher, when it is of some place in time that nobody else has actually experienced. Kind of like a great show by a great artist, except for the fact that there were other people there experiencing the magic. Enough said. Keep up the good work. Looking forward to your book coming out. I do plan to buy it. Just finished listening to All Four from the All Access Volume 1 by Greensky Bluegrass. Their signature song, all 16 minutes of it, in my humble opinion. Download the show for 10 bucks. You won’t regret it! Then, next time you head out on the road to Wrangell St. Elias (I’ll be jealous), crank up the car stereo and play that song! I promise you’ll love it! Peace. It must be something about having a few music degrees and teaching college-level music, but I absolutely do “practice” in the same way I practiced music. One goal of practice in music is to make the mechanical and technical stuff become so second-nature that it no longer stands between you and your expression. Ironically, the purpose of achieving technical mastery is to no longer have to be (as) conscious of technical issues. I actually have little visual perception games that I play frequently. For example, if I am riding a bus to work I may watch out the window and look for visual arrangements of objects to appear, perhaps making myself pick one every few seconds. Or I’ll pick a color and see how many subjects I can find in a scene that contain the color. Mind you, these are all done without a camera in hand. I also set a goal for myself of creating at least one new photograph that I’m willing to share with the world every day, and I’ve been posting them at my blog for several years now. Thanks for the great replies. And the head’s up on Greensky Bluegrass. I checked out All Access Volume 1 on itunes, and will definitely download it. Break mountain Brokedown smokes. 2 hours on the Mandolin is awesome. Do it daily, bruh! Work like that and you’ll be on fire in a year or less, I’m sure. Glad you’re enjoyin’ the blog. That Teton day was amazing. So incredible. And yes, Tony and Dave made it that much sweeter. Tony has some of the greatest touch on an acoustic guitar I’ve heard. Beautiful player! Visualization is a great mode of practice. I would similar things with guitar, visualizing chord shapes, scale patterns, fingerings, etc, or trying to visualize a riff I heard someone play, etc, etc. Or just consciously listening and composing phrases in my head, rephrasing them, etc, etc. There’s a lot we can do without our instrument/camera at hand. Hey Rocky – Musicians call that working on your chops. I know I practice with a long lens if I’m heading off to shoot brown bears for a couple of weeks. For static stuff, like wide angle landscapes, it’s much more about composing than operating the gear. But I know, for example, I practiced a lot with GNF filters, and so forth. These days the most ‘practice’ is probably playing with PS tools. Yep, so true… I was recently at a Wedding Photographers convention and listened in on a very successful wedding photographer from up North in the UK. He was saying that he spends an hour a day out with his camera… gives himself a subject eg. (red) and off he goes and shoots everything that might represent red. I try to adopt that attitude, it is difficult but as the say the more you practice the better you become.